Anfinsen, who was of Norwegian descent, obtained a BA degree from Swarthmore College in 1937 and an MS in organic chemistry in 1939 from the University of Pennsylvania. He spent the year 1939-40 as a Visiting Investigator at the Carlsberg Laboratory in Copenhagen, developing new methods for analysing the chemical structure of complex proteins, namely enzymes. In 1941, Anfinsen was offered a university fellowship for doctoral study in the Department of Biological Chemistry at Harvard Medical School, gaining his PhD in 1943. He spent the next seven years at Harvard Medical School; first as Instructor and then as Assistant Professor of Biological Chemistry. Anfinsen left Harvard in 1950 to become Chief of the Laboratory of Cellular Physiology and Metabolism in the National Heart Institute of the National Institutes of Health. He was again at Harvard Medical School as Professor of Biological Chemistry in 1962-63 and then returned to the National Institutes of Health where he has appointed Chief of the brand new Laboratory of Chemical Biology at the National Institute of Arthritis and Metabolic Diseases (now the National Institute of Arthritis, Diabetes, and Digestive and Kidney Diseases), where he remained until 1981. 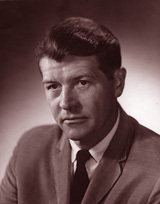 From 1982 until his death in 1995, Anfinsen was Professor of Biophysical Chemistry at Johns Hopkins. Anfinsen published more than 200 original articles, mostly in the area of the relationships between structure and function in proteins. He was also a pioneer of ideas in the area of nucleic acid compaction. In 1961 he showed that ribonuclease could be refolded after denaturation while preserving enzyme activity, thereby suggesting that all the information required by a protein to adopt its final conformation is encoded in its primary structure. Anfinsen was an editor of Advances in Protein Chemistry, served on the Editorial Board of the Journal of Biological Chemistry and wrote `The Molecular Basis of Evolution' which was published in 1959. He was active as a member of the Board of Governors of the Weizmann Institute of Science in Rehovot, Israel, and was elected President of the American Society of Biological Chemists for the academic year 1971-72. His honours include a Rockefeller Foundation Public Service Award in 1954, a Guggenheim Fellowship in 1958, election to the National Academy of Sciences in 1963 and the Royal Danish Academy in 1964, and Honorary Doctor of Science degrees from Swarthmore College (1965), Georgetown University (1967), and New York Medical College (1969). He belonged to the National Academy of Sciences (USA), the Royal Danish Academy of Sciences and Letters and the American Philosophical Society.